Characteristics of DC Motor are of the rotating armature type. The armature winding is a closed winding through the commutator. The armature is supplied through the brushes which are placed along the neutral axis on the commutator. The field system is stationary. The mmf produced by the field is along the mag­netic axis while the current flowing through the armature produces an mmf directed along the brush axis. The two mmfs are in space quadrature and occur simultaneously in the motor. They react with each other and develop a torque under whose action the armature rotates. A voltage is induced in the armature called the back emf. The direction of rotation can be determined by the left hand rule. The mmfs and the direction of rotation of the armature are illustrated in Fig. 1.1. A special feature of dc motors is that it is possible to connect the field and armature windings in several ways so as to achieve a variety of speed-torque characteristics. 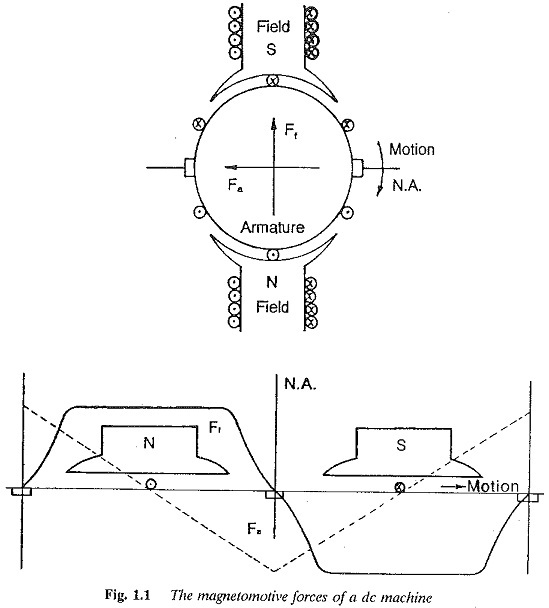 The motors are classified depending upon the type of connection between the armature and the field. In a separately excited dc motor the armature and field are excited by inde­pendent voltage sources. In a dc shunt motor the field winding is connected in parallel with the armature, both of which are supplied from the same source. In series motors the armature and field are connected in series and are obvi­ously supplied from the same source. In a compound motor both series and shunt fields are present. The performance of the motor is determined by the relative strengths of the series, shunt or separately excited field windings and by the orientation of the fluxes produced by them. Different types of dc motor connections are shown in Fig. 1.2. In a separately excited motor, it is possible to control both armature voltage and field current, so as to control the speed over a wide range in a smooth manner. Speeds ranging from zero to base speed may be obtained at constant torque by armature voltage control. Speeds above base speed are possible at constant power output by a weakening of the flux. Shunt motors operate at almost constant speed from no load to full load when operated from constant voltage mains. With a series connection of the field winding with armature an inverse relation between the speed and torque may be achieved. By properly adjusting the relative field strengths of the series and shunt windings of a compound motor a speed-torque curve with desired speed reaulation may be obtained. The speed-torque characteristic of an electric motor is very significant since it decides the application of the motor.